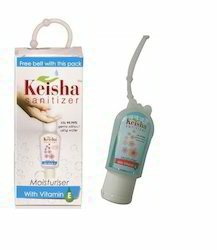 Keisha Hand Sanitizer combines 70% alcohol with a special blend of vitamin-E moisturizers to kill germs on your hands and leave them feeling soft and refreshed. The Chlorhexidine di gluconate kill all harmful germs which can causing illness. A light layer of moisturizers remains to condition the hands. We also have added perfume which rejuvenates us. 1.5 ml Sachet or Pouch, 10 ml pen sanitizer, 30 ml belt sanitizer, 50 ml, 100 ml, 500 ml, 1 ltr, 5 ltr etc. 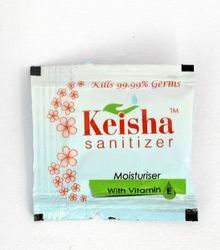 Hand Sanitizer Travelling Pack offered comes in quality constitution form and provides for effective killing of disease causing germs up to 99.99%. Further, the product comes in easy to use travel pack finish which makes it convenient to use anytime, anyplace and without need of water. Some of its features include post usage leaves hands feeling soft and smooth; superior anti-bacterial constitution that provides for highly effective results; features active ingredient of ethyl alcohol which makes it safe and effective antiseptic. We are really glad to inform you that with our vast research facilities we have developed a speciality product i.e. 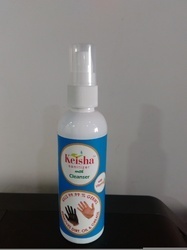 hand cleanser with sanitizer which not only kills all the harmful bacteria but also removes dirt and oil from your hands without using soap & water. 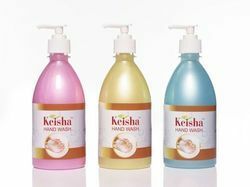 If your hands are oily or greasy washing your hands once with soap or liquid soap is not effective as you will still feel the oiliness but with Keisha hand cleanser with sanitizer the only thing you need are few drops of Keisha Hand Cleanser with Sanitizer and your hands will be totally oil free and bacteria free. Take 2-3 drops of Hand sanitizer with cleanser. Apply & gently rub it on your hands. Eureka your hands are bacteria and dirt free. Looking for Hand Sanitizer ?